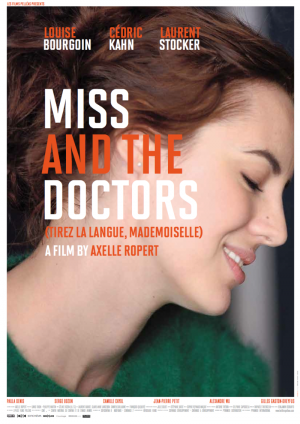 Miss and the Doctors (Tirez la langue, Mademoiselle) is a comedy-drama from French writer-director Axelle Ropert. A love triangle story, it is about two brothers, Boris and Dimitri (Cédric Kahn and Laurent Stocker) who are both doctors and who share a practise in Paris. Independently of each other, they both fall in love with a young woman Judith (Louise Bourgoin) who has a diabetic daughter (Paula Denis). Ropert traces these developing relationships and the complications that ensue. Axelle Ropert adopts a very muted, elliptical and somewhat distant tone. The plot plays out through a series of coincidences, which seem to be intended to stretch our disbelief, and moments that could have been fruitfully played for either comedy or drama occur off-screen. We are shown very little detail and when Boris and Dimitri both fall for Judith, we are never sure why. There is a suggestion that Boris and Dimitri may be so in need of a romantic relationship that they don’t care who they fall for, but this comes to nothing. And while it does initially seem that the film does have some kind of a strategy, that all will make sense as the film goes on, a totally flubbed ending ultimately suggests that the confusion is simply down to bad filmmaking. The film is passable, but it is rather vague and more than a little stiff. The three lead actors suffer with under-developed characters and the script offers ample backstory but no real development. The direction is fine though some scenes seem badly thought-out, such as one key scene’s odd focus on a goofy organ grinder, who seems important but turns out not to be. Ultimately, the film has little going on, beyond a very traditional story told lethargically.